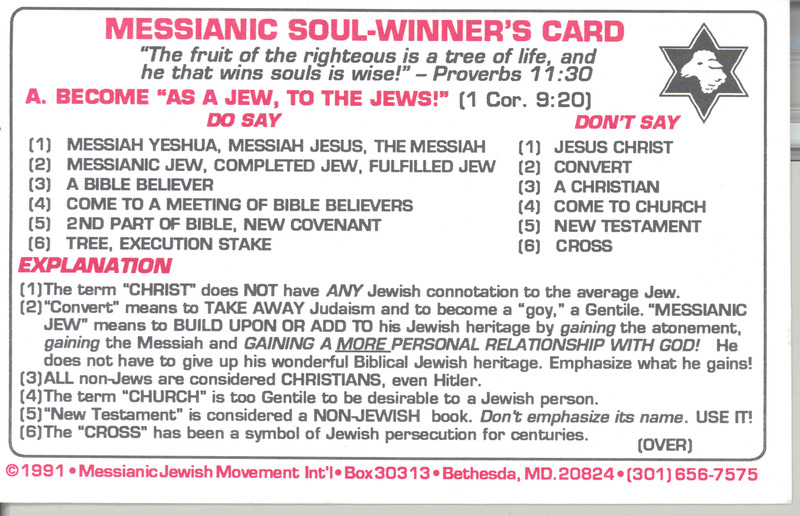 It’s no secret that Christian missionaries have been trying to convert Jews to Christianity for almost 2000 years. Many Jews who had no other choice, choose death over conversion, thus sanctifying Gods name in the most significant way. Others fled from country to country so they can continue being a practicing Jew. Throughout history, some missionaries were successful at converting Jews, not by the threat of physical harm, but by preaching lies and fairy tales. 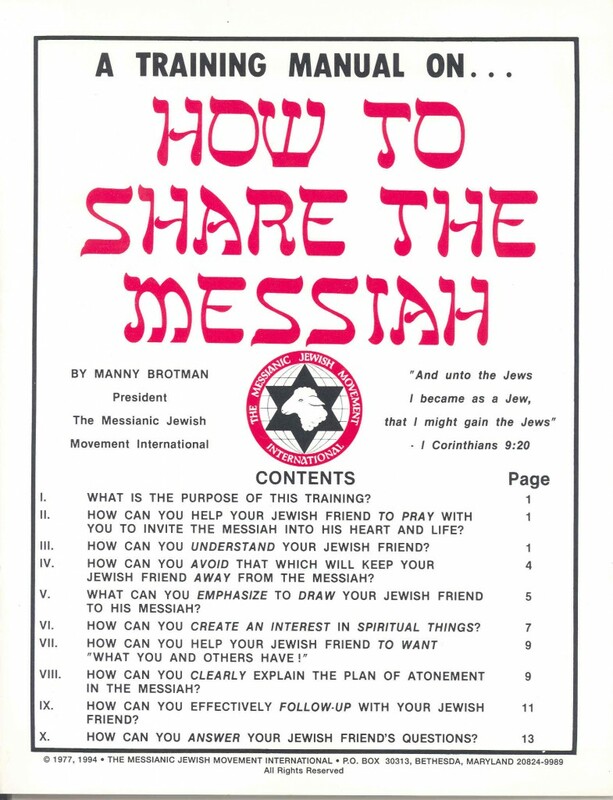 The biggest threat to any con is to educate the public, and as the Rabbi’s started warning against missionaries, converting a Jew became much harder. The missionaries were not happy with their limited results, they felt more can be done to entrap the innocent Jew. So approximately 45 years ago they devised a new plot, possibly one of the most ingenious plots Christian missionaries concocted in the history of Church. This new group has leaders that call themselves Rabbi’s, they might even wear a tallit and tefillin, all in hopes of getting an innocent Jew that does not know better to believe in Jesus. Some know full well that to a Jew with even the most basic knowledge of the Torah, the word Jesus is synonymous with idolatry, magic tricks and fairy tales. So they came up with a new tactic, instead of using the name Jesus let’s call him by his Hebrew name “Yeshua” (or a version of that). After all, a Jew might give you a few more minutes of his time if you are talking about someone named “Yeshua” vs. Jesus. In addition, knowing full well that every Jew knows the concept of Moshiach (Messiah) let’s claim that he in fact is the Moshiach they are waiting for, often times in their videos they say “Yeshua HaMahshiach” (sometimes HaMahshiach as some have a hard time saying the “ach”). However that wasn’t good enough. Jews figured it out. This created a huge problem, how can we create videos and talk about “Yeshua HaMahshiach” if the Jew already was trained that “Yeshua HaMahshiach” = Jesus? The fix was simple, and it goes like this. Create tens of thousands of videos and distribute them all over the internet. However, do not mention the name “Yeshua HaMahshiach” until the last few seconds in the video, this way, the innocent Jew sits and listens for an hour or so about general things related to end times, a topic that many are attracted to, and then in the last few seconds BOOM, announce that the Mahshiach is “Yeshua HaMahshiach”, and he will return as soon as a few more Jews believe that he is in fact the Mahshiach. But it gets even worse, way worse! The missionaries figured out that their target market, meaning those likely to convert, are those who don’t speak Hebrew, and even if they do, they never really studied the Torah as in the Chumash (First five books), and even if they studied that, there is a good chance that other than Tehilim (Psalms) they never read any other books that are part of the Jewish Bible commonly known as the Old Testament. So the missionaries went back to an old tactic, and that is, manipulate texts in the Old Testament (The Tnach), twist and turn a few verses, and show proof that the Prophets (Neviem) predicted that Jesus is the messiah. Now a Hebrew speaker and someone who studied the Torah within its context, their manipulated verses would make one laugh out loud (if it wasn’t so sad). These missionaries are either clueless or deliberately mistranslating and taking out of context even the most basic words and concepts. Therefore, the innocent Jew who doesn’t know better is extremely vulnerable, and unfortunately, sooner or later the missionary succeeds and gets an innocent Jew to commit what the Rambam (Maimonides) and others (not to mention the Torah itself!) define as Idolatry. So how do you combat this problem? After all, if a Jew is shown that the very Torah he was raised to respect, tells him (via some nonsense translation and out of context manipulation) that Jesus is the Moshiach, what is he or she supposed to do? Welcome to the world of Rabbi Tovia Singer, the founder of Outreach Judaism. The first thing that comes to mind when one reviews his work is the Mishnah in Pirkei Avot: (2:14) “Rabbi Elazar would say: Be diligent in the study of Torah. Know what to answer a heretic (apikuros). And know before whom you toil, and who is your employer who will repay you the reward of your labors”. In his letter to Yonason of Lunel The Rambam (Mimonodies) writes that he studied the works of other nations just so he can show them the beauty of the Torah, at one point he writes that there was almost no book that was translated to Arabic that he didn’t read. And all this was so he should know what to answer to an apikuros. Rabbi Singers extensive knowledge in both the Old Testament and the New Testament is one of the main reasons that even those that are totally submerged is the Jesus idolatry, wake up and abandon it completely. Rabbi Singers videos also have incredible amounts of likes, as when you watch his videos he leaves no doubt that what he is saying is the honest truth as to what the text means. He shows proof over and over again that the church deliberately mistranslated words in certain places to further the Jesus is god or the son of god or a mix of all types of ideas, that are still evolving as I write this. I am mentioning the likes on the video because rarely will videos that destroys the Jesus myth get positive reactions. After all, most of the Jesus followers do so because of a massive superstition, they really believe if they say Jesus is Lord or other nonsense, Jesus will help them out. It is both sad and funny to watch them stick up for their Jesus idol, and say things that they themselves have a hard time making sense of, and rightfully so. Rabbi Singer shows great respect to all Christians and feels that because they don’t speak Hebrew for the most part, how should they know better? So why is Christianity so popular? Well, if you have a religion that tells you follow nothing just believe in Jesus and you are guaranteed a great afterlife, sure, weak minded people will abandon religions that have so many laws and just gravitate to that nonsense. After all, most people want to believe in something, however, if that something means you can eat whatever you wish, work on whatever day you like, do whatever sins you want, and you easily are forgiven with no fasting or extensive praying, then sure, many evil people OR people who refuse to do real research, will sign up. Judaism is not a simple religion, there are many laws. Many Jews just feel overwhelmed and feel disconnected, hence the rise of lighter versions of Judaism. However, believing in the God of the Old Testament, the creator of the world, the life of everything, the God that Abraham recognized, is not up for debate. And no, that God did not come down on earth to get beaten by the Romans (he could have had them beat him up there, then again, maybe he needed the miles?) nor did he cause a virgin to have his son (or himself) just so you can eat a ham sandwich, work on Saturday and ignore the Old Testament. I should correct that, Christians don’t ignore all of the Old Testament, after all how can you not love the Noah’s Ark or the Garden of Eden story. However, the verses that don’t go well with their belief system they ignore, for example: In Deuteronomy / Devarim 4:2 it clearly states not to add or remove from the Old Testament (when Rabbis do add it is to ensure people keep the laws not abandon them, commonly known as a “fence” to the mitzvot). What about the verses in Malachi 3:6-7 where God says He is the God and he did not change, return to me and I will return to you, and the beautiful ending of that chapter (Verses 22-23) where god says: Remember the laws of Moses my servant, which I commanded unto him in Horeb for ALL of Israel, statutes and ordinances. Behold I will send you Elijah the prophet before the coming of the great and terrible day of the Lord”. The New Testaments theory says that John the Baptist was Elijah and he already came but people didn’t recognize him and he was killed. These are the ridiculous tales so many Christians believe. There is one other point I would like to make that I feel is sometimes not mentioned enough. Prophet Yeshaya (Isaiah) for example was not a cryptic speaker. When he wants to talk about Egypt he says Egypt, if he is talking about Damascus he says Damascus, if he’s talking about End times or anything else he states so clearly. A person can read the book of Isaiah and together with the Rashi commentary understand everything that is mentioned there. Even without the commentary, most can understand the book, that is if they speak Hebrew. Regardless of your level of understanding, a sane reader won’t see the Jesus myth in any of it. If you know someone that needs help / clarification I would advise you to send them to Rabbi Tovia Singer’s YouTube Channel. Even if you have no doubts and I know most readers don’t, watch his videos, sometimes we forget how beautiful the words of the Torah is. The following is part of a missionary training manual and a communications cards. Rabbi Singer shared this information so people can see first hand the extreme lengths missionaries go to try to convert or as they call it “complete” a Jew, maybe “complete” as in “finish off” and “destroy”. You can click the images to enlarge. Rabbi Singer does not ask for donations in any of his videos, a fact that makes one wonder if he’s a true Rabbi? Seriously though, do the right thing and support his organization Outreach Judaism. You can do so by visiting http://outreachjudaism.org/shop/ check out some of the amazing products that you can buy to enhance your own knowledge or the Knowledge of a friend. You can also donate when you visit the above link. Keep in mind, the missionaries have seemingly unlimited funds, it takes real financial resources to put up a fight online. Some have gotten so scared of the damage Rabbi Singer does to their work, that they are now paying YouTube to have their videos come up if someone searches for Rabbi Singer! R’ David ben Avraham Maimuni HaNagid ZT’L (The Rambam’s / Maimonides grandson) writes in his work Midrash David on the Mishnah in Pirkei Avot (2:14). “Rabbi Elazar would say: Be diligent in the study of Torah. Know what to answer a heretic (apikuros). And know before whom you toil, and who is your employer who will repay you the reward of your labors”, that one should not say to themselves “why bother debating this apikuros”? He won’t change anyway. Because for this the Mishna says, “know before whom you toil” and God won’t forget the effort you put in and G-d will reward you accordingly. It is without a doubt that the work of Rabbi Singer saves real souls with his work, and at the same time sanctifies Gods name in the most significant of ways. R’ Shabsai HaKohen Katz (commonly known as The Shach) writes in his book Poel Tzedek (Day 6, 506) that those who sanctifying Gods name publicly will see rewards for themselves and their offspring on this planet, and in the world to come. We now have the blessing to be able to take part in sanctifying Gods name in public. Everyone should do whatever it is they can to take part in this. Be it financially or be it sharing the website / videos. It is the right thing to do.